As an award-winning HVAC contractor in Minnesota, we help our residential and commercial customers save the costs of buying new heating furnaces, installing commercial rooftop heating and cooling systems, and maintaining their HVAC equipment. We purchase large volumes of products from Carrier, Lennox, Goodman and Payne and pass the savings on to our valued customers. From time to time, manufacturers and utility companies offer cash rebates and promotional deals. We will be happy to explain to you what models qualify for the special discounts and rebate offers. We always help our customers maximize their savings and lower their costs. Buy a 96% efficiency Carrier home-heating furnace and a matching AC. 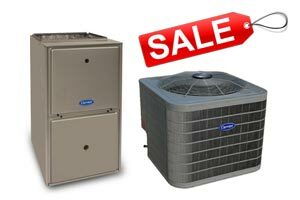 BEST furnace and AC package deal. Fast installation and additional rebate savings! Limited quantities for a sales offer. Not valid with other sale or discount offers. Choose any of our reliable, efficient rooftop HVAC units. Fast installation, low-cost scheduled maintenance service. Keep your commercial property comfortable year-round. $500 instant discount on a new boiler installation. Up to $500 in cash rebates. Save more with better energy efficiency. High-efficiency, quiet cooling for any room. Easy temperature control and extremely reliable. Rebates up to 50% of incremental cost for upgrading to higher efficiency systems. Call us to find out how much you can save with your new rooftop HVAC. Limited-time offer. Not valid with other discount offers. Customized HVAC maintenance plans to meet your commercial building’s requirements. Monthly, quarterly and annual maintenance plans available. Scheduled preventative service to ensure the safe operation of your HVAC equipment. Rebates from Xcel and CenterPoint Energy. Purchase a high-efficiency furnace and central air conditioner. Call us for detailed pricing and qualification information. Qualifying for the Carrier Cool Cash Program and receive up to $600 rebates. Qualified products include 96% efficiency furnaces and air conditioners. 10-Point furnace maintenance check-up. Test Carbon Monoxide levels. Keep your family safe and your furnace running smoothly. Prevent costly furnace repair and recommended annually. Save $20 on our fast reliable furnace repair service. Save on any regular service calls and emergency service calls. Repair equipment of all brands with a large stock of replacement parts. Thorough cleaning of all your air ducts. No hidden feeds. Having a reliable HVAC contractor gives you peace of mind that you need during our long, cold Minnesota winters. As the most trusted residential and commercial HVAC company in the Twin Cities, we make buying or upgrading your heating system affordable. We offer a wide range of rebates, promotional deals and discounts on high-efficiency forced-air gas furnaces and commercial rooftop HVAC units made by Carrier, Goodman, Lennox and LG. Call us and schedule a free in-home or on-site cost estimate. We will provide an accurate quote on the price of your new furnace and the installation cost. Our sales staff will discuss your requirements and offer you the most suitable heating and cooling system or scheduled maintenance service plan for you. We are the one-stop shop when it comes to your home heating and business HVAC needs.